Bulgaria’s coalition of ultra-nationalist parties, the United Patriots, has hit its latest turbulence with Deputy Prime Minister Valeri Simeonov’s party withdrawing its confidence in Ataka party leader Volen Siderov as head of the coalition’s parliamentary group. The step, taken on October 17, was a result of Siderov using his mouthpiece cable television channel Alfa to mount an attack on Simeonov as “Soros’s man” in the Bulgarian government. The United Patriots group is the minority partner in Bulgarian Prime Minister Boiko Borissov’s government. The group has been wracked by public infighting throughout 2018, with attempts to patch up differences hardly lasting. In a bizarre spectacle, Alfa stopped its regular broadcasts on October 15, blaming the government, though it was not clear why. Replacing its broadcasts with black slides with messages against Simeonov on the evening of October 16, Alfa was the subject of an inquiry from the broadcast regulator the Council for Electronica Media as to why it had stopped its broadcasts. The Alfa stopping of broadcasts stunt left viewers, and almost everyone else, puzzled. For close to two days, Siderov and other Ataka politicians made themselves unavailable for comment to Bulgarian journalists seeking explanations for the episode. In a statement on October 17, Simeonov’s party, the National Front for the Salvation of Bulgaria (NFSB), said that it was removing its confidence from Siderov as the chairman of the United Patriots parliamentary group. The NFSB said that it would be represented by the deputy chairmen of the party, Valentin Kassabov and Boris Yachev. The party said that “Volen Siderov’s public statements and behaviour at home and abroad (including in Russia) should in no way bind the NFSB political party”. Among the differences within the United Patriots is that Siderov is consistently pro-Russian while Simeonov is skeptical of Putin’s Moscow. A further source of tension is Siderov’s ambition to head the United Patriots’ candidate list in Bulgaria’s May 2019 European Parliament elections. Complicating that is that it is not even clear whether the United Patriots’ three constituent parties will stand together in those elections. 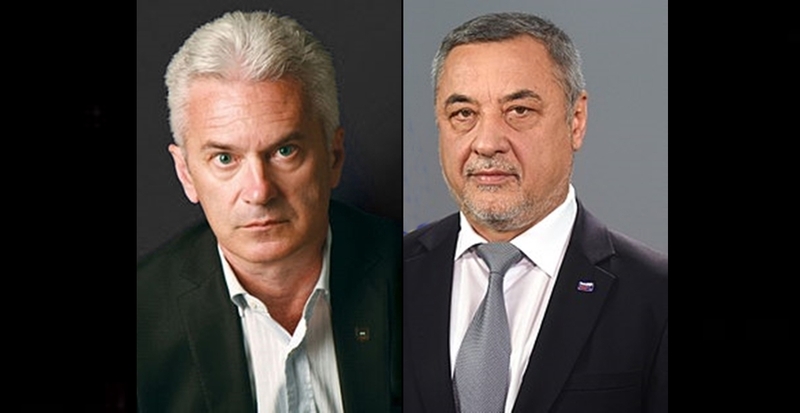 Recently, Siderov has been politically flirting with the party of Nikolai Barekov, a current MEP who has said he will not seek re-election, after winning a seat on the ticket of his previous populist party. The NFSB said that the United Patriots’ coalition was stable and the party did not intend to leave it. The NFSB’s Yachev told journalists that Alfa TV continued to broadcast slander against Simeonov and other coalition members, including Tsvetan Tsvetanov, the parliamentary leader of Prime Minister Borissov’s GERB party. Siderov also has been frustrated at repeated cancellations of meetings of the governing majority’s coalition council, which he wants to use to push his candidate to be the new chief secretary of the Interior Ministry. Tsvetanov, as well as United Patriots co-leader and Deputy Prime Minister Krassimir Karakachanov, have said in recent days that a number of names are being considered for this post, which fell vacant in late September when the incumbent was elected Interior Minister.